I received a really nice award last weekend from Susan at Susan Heim on Parenting. 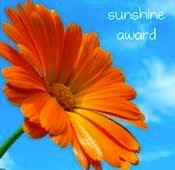 Thank you so much for the Sunshine Award! It's my first blog award. I actually struggled to narrow my list to just 12, but these are some that I visit most regularly. You deserve it. You do an awesome job! Thanks so much for the lovely award!